If you know me personally there are four individuals, legends of film that I always speak about, or highly praise. 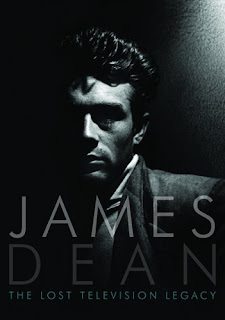 One, Gary Cooper, two, Bette Davis, three, Jimmy Stewart and four, the one and only, James Dean. East of Eden is one of my favorite films of all time. 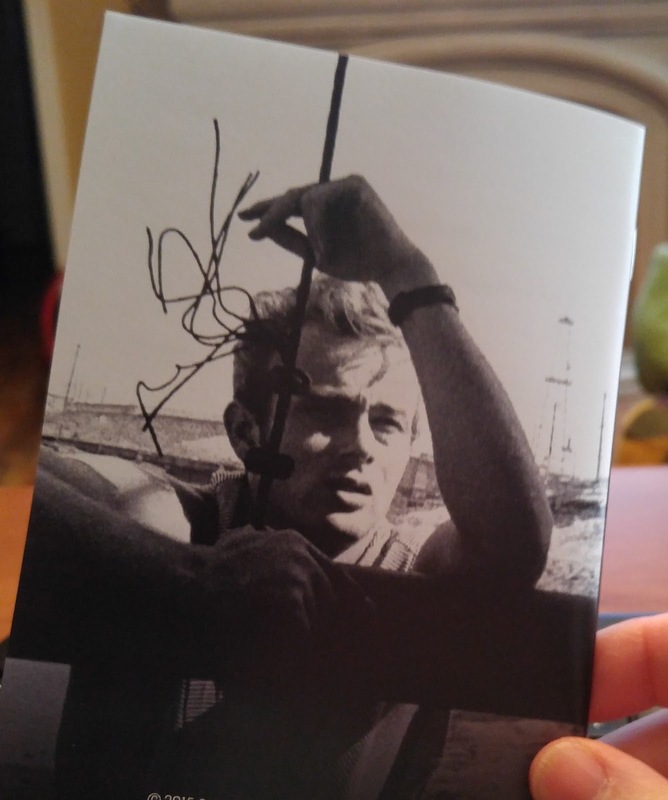 When I was sent this to review, and then realized that this was early James Dean, I was in heaven. Total bliss. Dean was, and is, one of the coolest, sexiest, believable, men of acting history. He was cinematic gold. 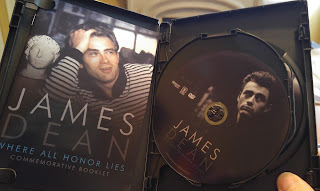 What many people do not realize is that James Dean was not just about the movies. It was the movies that made his name known, and created a legend that still remains strong today, even after his death, over 60 years ago. Dean before the cinematic stardom with the powerful performance of East of Eden, and the all-around perfection of Rebel without a Cause, is he played in live television programs. Such shows as Family Theater, Westinghouse Studio One, Kraft Television, General Electric Theater and many others were a huge success, and families all across the nation set in front of those wonderful. Black and white, Wooden Boxed TV’s of the olden days. This is absolutely an amazing product of high quality. Any lover of the cinema world must own this. Fans of James Dean. 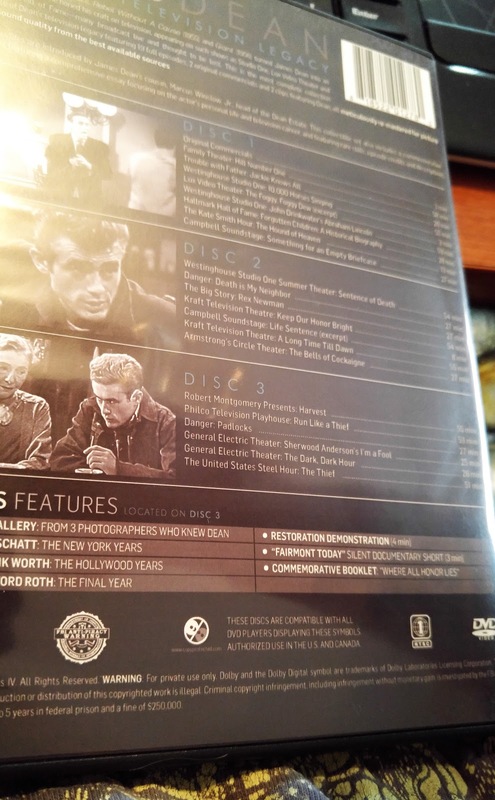 Fans of older cinema will be absolutely enthralled with this DVD. This is a 3 Disc set. It also comes with an insert commemorative booklet, coming in at 20 pages. This insert booklet is an amazing read. This booklet is written by James Ritz. It details some brief history, and also a synopsis of the 22 programs. Each of the programs are different in running time. There are 9 programs a little under an hour. 9 programs a little under 30 minutes. 1 program under 10 minutes. One set of commercials with a running time of 3 minutes. 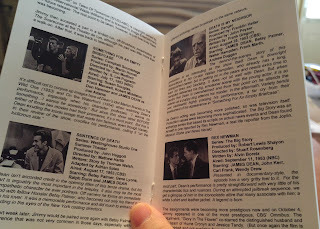 A program of 8 minutes, which is an excerpt of the Campbell Soundstage: Life Sentence. And one program at 13 minutes. 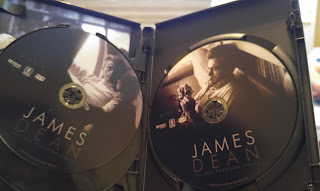 Something that really caught my attention, was yes all the amazing love that went into bringing this product out, but also that each episode is introduced by James Dean’s cousin, Marcus Winslow Jr. Winslow is the head of Dean’s estate. I can’t speak highly enough about this DVD product. To me anyone who is a movie buff, cinema lover, must own this product. This is a one of a kind mastery, put into this product. There was such care and love in creating this, and you can see that in the finished product. Also what is amazing, is that this is like a time capsule of stardom. Not only do you have James Dean, but you have perfection in actresses and actors, such as Natalie Wood, John Forsythe, Dorothy Gish, Ed Begley, Ruth Hussey, John Carradine, Gene Lockhart, and many others. Seeing James Dean in these early roles is a trip into nostalgia. A golden era of acting perfection, which would lead to one of the most iconic actors in imagery, and performance. His life was short. His movies where of few, but his legacy is still strong, if not stronger than ever. Products like this give the fan a perfected experience that lingers, and creates a giddy feeling of watching such dynamic moments of star history. Aspect Ratio is widescreen. It has a running time of 768 minutes. Audio is English: Mono. Black and white and color. For being as old as they are, and being during a time period where TV, and films where never really protected, this product shines. There is such a lovely restoration to all these programs. I had only seen a few of them before this product, and remember the ones I saw, comparing it to this product, is like night and day. The old ones I saw where damaged, and lacked any care. This product shines and looks better than any other example out there. Photo Gallery from 3 photographers, Roy Schatt, Frank Worth, and Sanford Roth. Who each knew Dean. Roy Schatt was, The New York Years. Frank Worth was, The Hollywood Years. Sanford Roth was, The Final Years. A wonderful 4 minute program on showcasing the restoration of the programs and what it took. A 3 minute silent documentary titled, Fairmont Today. This is a great program in showcasing James Dean’s hometown in Indiana. As I have stated, The Commemorative booklet. 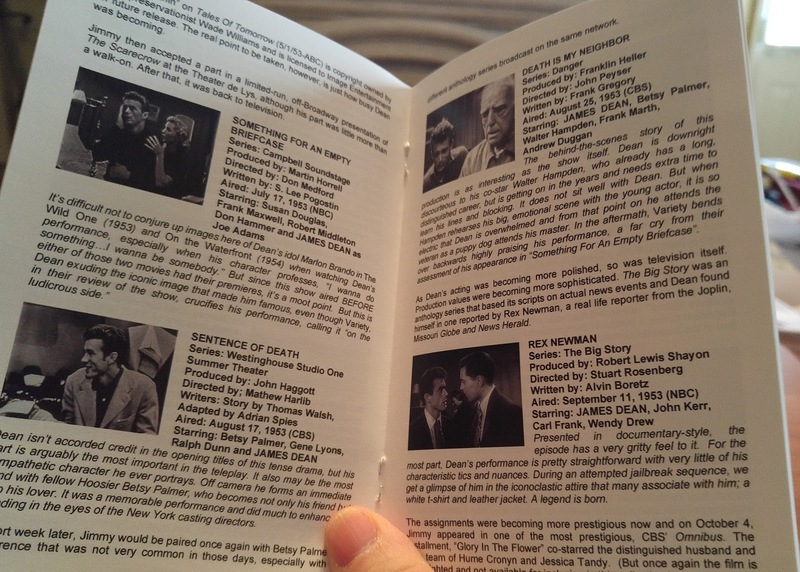 List of Programs on the 3 Disc. Original Commercials both for Pepsi Cola. 1950’s, runtime of 3 minutes. Hill Number One, which is a religious telling of John, one of Jesus Christ Apostle. 1951, runtime of 58 minutes. Jackie Knows All: Which was an episode for the TV series, Trouble with Father, which ran on ABC. 1952, runtime 26 minutes. 10,000 Horses Singing, which was an episode of the TV Series, Westinghouse Studio One, which ran on CBS. 1952, runtime 55 minutes. The Foggy, Foggy Dew, which was an episode of the TV Series, Lux Video Theatre, which ran on CBS. 1952, runtime 3 minutes. John Drinkwater’s Abraham Lincoln, which was a part of the Westinghouse Studio One series that ran on CBS. 1952, runtime 53 minutes. Forgotten Children: A Historical Biography. This was a program for the TV series, Hallmark Hall of Fame that ran on CBS. 1952, runtime 28 minutes. The Hound of Heaven, which was part of, The Kate Smith Hour TV series that ran on NBC. 1953, runtime 13 minutes. Something for an Empty Briefcase, which was an episode for the TV series, Campbell Soundstage that ran on NBC. 1953, runtime of 27 minutes. Sentence of Death, which was an episode for the TV series, Westinghouse Studio One Summer Theater. 1953, runtime 54 minutes. Death is my Neighbor, which was an episode for the TV series, Danger, that ran on CBS. 1953, 27 minutes. Rex Newman, which was an episode for the TV series, The Big Story that ran on NBC. 1953, runtime 27 minutes. Keep our Honor Bright, which was an episode for the TV series, Kraft Television Theatre that ran on NBC. 1953, runtime 54 minutes. Life Sentence, which was an episode of the TV series, Campbell Soundstage that ran on NBC. 1953, runtime of 8 minutes. A Long Time Till Dawn, which was an episode of the TV series, Kraft Television Theatre which ran on NBC. 1953, runtime of 55 minutes. The Bells of Cockaigne, which was an episode of the TV series, Armstrong’s Circle Theater that ran on NBC. 1953, runtime of 27 minutes. Harvest, which was an episode of the TV Series, Robert Montgomery Presents which ran on NBC. 1953, runtime 55 minutes. Run like a Thief, which was an episode of, Philco Television Playhouse which ran on NBC. 1954, runtime of 53 minutes. Padlocks, which was an episode of the TV Series, Danger that ran on CBS. 1954, runtime of 27 minutes. Sherwood Anderson’s I’m a Fool, which was an episode of the TV Series, General Electric Theater that ran on NBC. 1954, runtime 25 minutes. The Dark, Dark Hour, which was an episode of, General Electric Theater TV series that ran on NBC. 1954, running time of 26 minutes. The Thief, which was an episode for the TV Series, The United States Steel Hour that ran on NBC. 1955, runtime of 51 minutes. I proudly display this DVD on my shelf and any fan of cinema should do the same. I am amazed and floored at the love and care that went into this product. I, being a James Dean fan, smiled, laughed, was amazed, and even got a little emotional, because of how this brilliant man died way too soon. Every time I watch East of Eden, or Rebel, or Giant, I think of this 24 year old man, how he had so many more years to impress, and give satisfaction in cinema. Thankfully there are his films, and now most importantly a collection of all the remaining TV shows. Sadly over the years many of his appearances have been lost, but the few that remain are now given on a top quality product. 10 out 10, Perfection. One of the best products I have seen. Lovingly cared for. These old, lost, forgotten about experiences are restored in the best way possible. James Dean was honored, respected, and most of all, shared with a modern generation, and the older generation that love him so.